The Powered GM variant of the RGM-79C was developed by the Federation as a testbed for an enhanced backpack that provided very powerful thrust and acceleration. To compliment this enhancement, the legs were mounted with improved shocked absorbers. Because of this, the Powered GM looks more heavily armored externally, which wasn’t the case since the bulkiness was mainly due to the mounting of the backpack control systems and further improvements to the structure of the RGM-79C. At least 3 units were tested with this modification in the Torrington base facility in Australia in UC 0083. The conversion parts came in two very nicely molded trees in a medium gray color. Advanced notice from a good friend of mine Evo (he of the masterfully done Gundam kits in the Guest Gallery) says that the fit is very good with no puttying required. But then again, he almost always NEVER needs puttying in his kits. Initial impressions so far are positive. There are no visible flash or warped plastic to be found. While the panel lines seem a bit on the thick and deep side, these are negligible problems since the MG kit that is required for this set doesn’t have too many panel lines that will make the discrepancy obvious. The animated version of the Powered GM didn’t come with any special markings except for a very unique orange and white color scheme (see lineart above). But that won’t stop anyone from making some custom markings for this badass. It certainly won’t stop me . 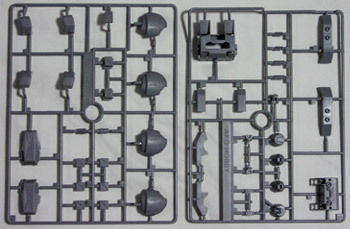 Akohobby’s website has some images of what the converted GM Kai would look like as a Powered GM. Do check it out.